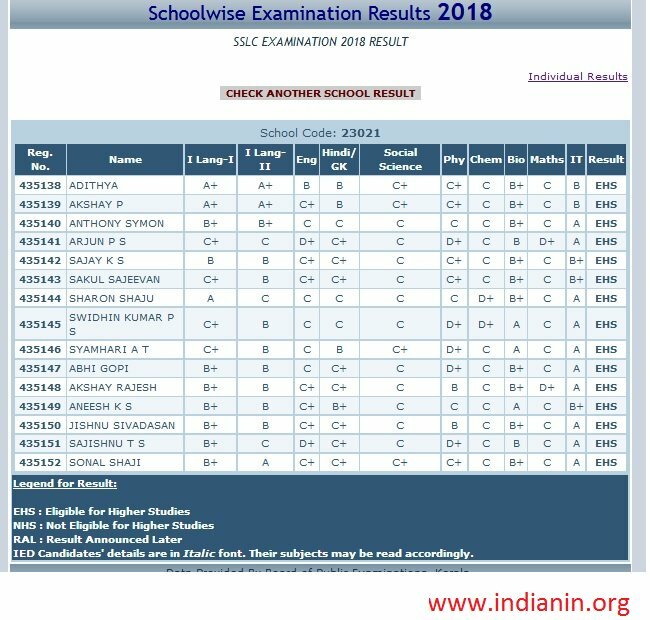 Kerala SSLC result 2018 has been declared by the education minister Professor C Raveendranath from Thiruvananthapuram. Kerala Pareeksha Bhavan will release the result after announcing it officially. Students can check the result at the official website of Kerala Pareeksha Bhavan and also from other websites which host board exam results. ** This year, 4.41 students appeared for the SSLC exams this year out of which 2.16 are female candidates. Last year, Kerala SSLC results were declared on May 25. Go to any of the websites – kerala.gov.in, keralaresults.nic.in. Click on the “SSLC EXAM RESULTS – 2018 ” link result page will be opened. Step 2 : Click on “Get School Result” button. ** As per reports, 97.84 per cent students have qualified for higher studies. Of the 4,41,103 students who appeared for the SSLC exam, about 4,31,162 have cleared the examination. Last year, the pass percentage was 95.98 per cent. ** As many as 34,313 students secured A+ for all subjects. While Ernakulam district come first with 99.12 per cent victory, Wayanad district come last with 93.87 per cent. ** The students can submit the application for revaluation and scrutiny of answer papers from May 5 to 10, 2018.